It will take you more than 12 hours by road from Dar Es Salaam to get to Namtumbo district of the Ruvuma region in the Southern part of Tanzania. This is the district that is the home to the only community based conservation training college in Tanzania. The college is in an area called Likuyu Sekamaganga just at the tip of The Southern sector of Selous Game Reserve. The college was established in 1993 and has trained more than 4000 village game scouts from Tanzania as well as Mozambique. In 1995 the college was established in the buildings of an old refugee camp in Southern Tanzania. It was yet another graduation for at the college that brought interested participants from across the country to witness this moment for the conservation of natural resources in Tanzania. 55 Village Game Scouts (VGS) were graduating and the mood was really jubilant, ceremonial and a sign of a better future for nature and humans as well. This is part of WWF’s Zero Poaching approach to tackling elephant poaching in the Selous, which is also a World Heritage site. Unlike other graduations in the Likuyu Sekamaganga this graduation had the biggest number of women. History was written. For the first time women made up a third of the 55 graduating VGS. These women had endured all the grueling exercises and tough training to successfully acquire the essential skills that will make them part of the custodians of nature in their villages. “I come from a village just near Selous Game Reserve, since I was a small girl I wanted to become a ranger, their strength and how smart they were made me want nothing else but to be one of them. When I grew up and understood what the ranger’s work entails I determined even more to become a ranger myself, this kept me going. And the solidarity among us was another reason I was determined to go through it all and eventually graduate. We encouraged and supported each other constantly; we had a really great team spirit”. Hanifa continued. Like all the VGS Hanifa is very motivated and looks forward to bring about the changes needed in their areas and villages. In Chimbuko village where Hanifa comes from bush meat is a thriving business, where people sell and buy openly, but they also still have the challenge of human and wildlife conflict where animals will destroy farms. These are the things that Hanifa wants to deal with after receiving the training at Likuyu Sekamaganga. She says she will work closely with the village natural resources committee to educate her community on the dangers of the bush meat business and its impact on wildlife. WWF Tanzania has sponsored two intakes of training for a total of 75 VGS where in the first intake 25 VGS were trained. 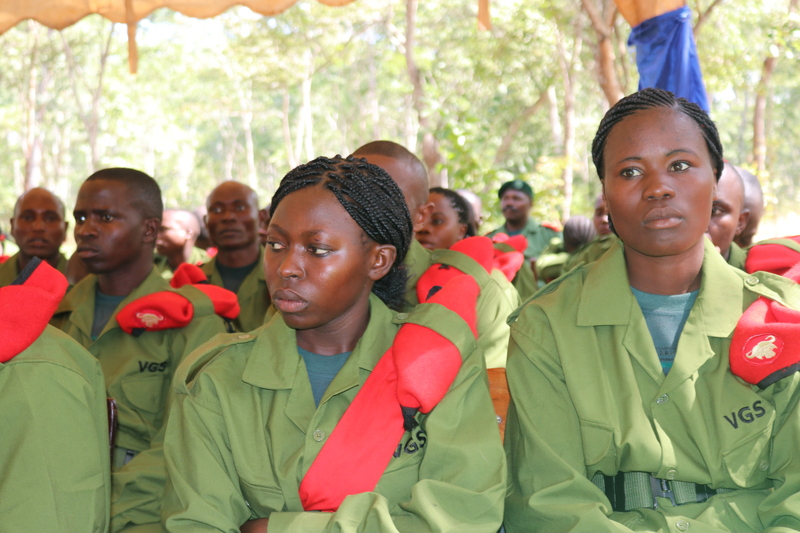 The graduating ceremony was characterized by drills, showing off their skills, and a guard of honor. Officiating at the event, the Permanent Secretary for the Ministry of tourism and natural resources Major General Gaudence Milanzi underscored the importance of village scouts in the protection of wildlife in the country. He said village game scouts also help in preserving the country’s heritage, which is beneficial to future generations. Speaking at the same function, WWF Tanzania’s Conservation Manager Dr. Simon Lugandu called on village game scouts to be bold and use the skills they acquired during training to face poachers and help conserve wildlife and other natural resources. He said WWF will always be willing to support the VGS and the government in the efforts to conserve Tanzania’s natural resources. A key part of WWF’s Zero Poaching approach is to work with the communities around the Selous Game Reserve and integrate their work with that of the Rangers inside the World Heritage site. Ensuring VGSs are properly trained and equipped is important to stop the poachers that move through community land. Village Game Scouts being from the communities near the reserves and parks perform an important responsibility of protecting wildlife but they face challenges including lack of working gear like tents, binoculars, communication equipment and financial support for patrols, and of course the risk on their lives.